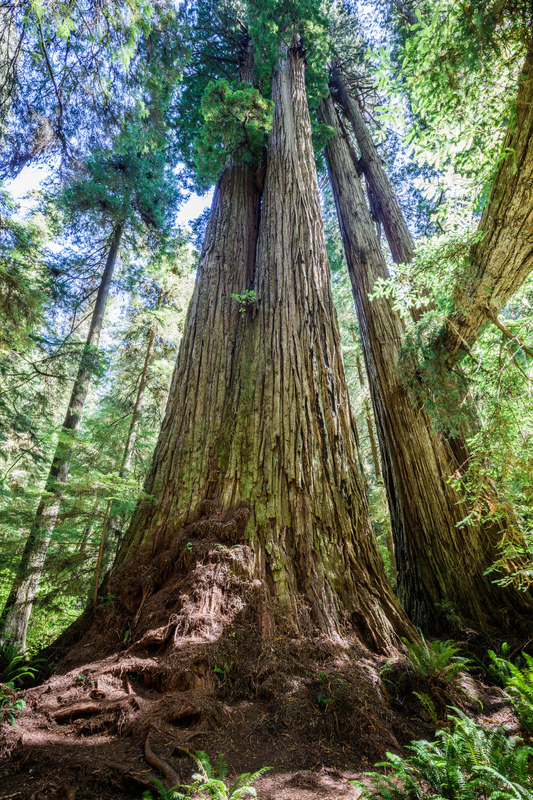 Deep in the heart of Jedediah Smith Redwoods State Park lies a grove of ancient redwood trees renowned and named for their remarkable size. 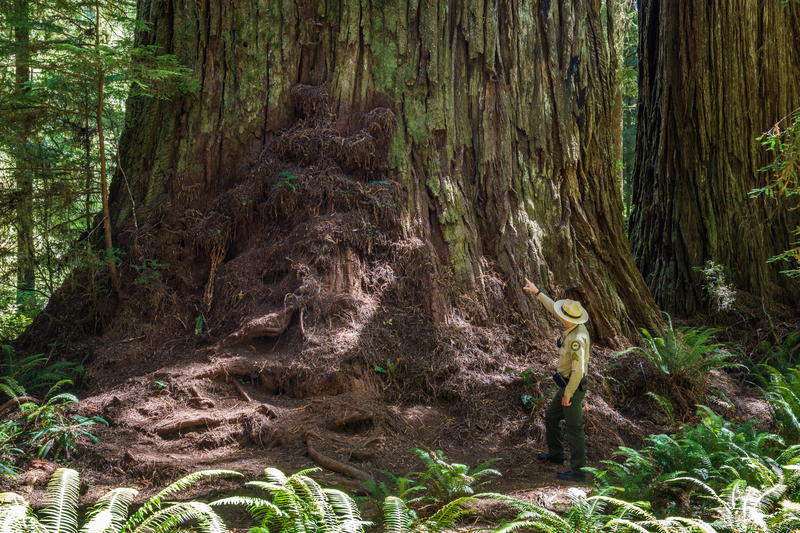 Discovered by researchers in the 1990s, the Grove of Titans was locally revered as one of the most impressive collections of massive redwoods along the north coast. There is no direct access to the grove, which kept it relatively hidden for many years. That is, until the location of the grove was posted online and via social media. With coordinates in hand, many determined visitors have made their own trails in search of the elusive trees. 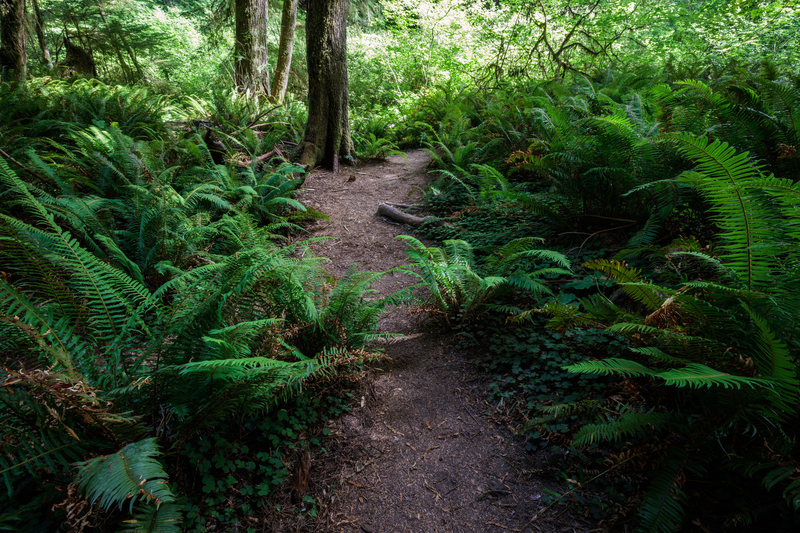 With increasing visitation in recent years, “social trails” through the Grove of Titans have expanded into a vast network of weaving footpaths. These social trails are so well-traveled, that they are hard to distinguish from official park trails. Damage to the forest floor is increasingly visible, with trampled vegetation, stripped bark at the bases of trees, compacted soil and exposed redwood roots. Unmanaged trails also transport sediment into Mill Creek, a salmon-bearing stream adjacent to the grove. California State Parks Peace Officer, Brett Silver, points out visible damage to the base of an ancient tree caused by off-trail hiking including stripped bark and understory, exposed tree roots, and compacted soil. The Grove of Titans contains a dense collection of massive redwoods. Although there is no trail access to the grove, these ancient trees are frequently visited by off-trail hikers. Rerouting the nearby Mill Creek trail to lead to the grove, installing an elevated walkway, removing social trails, and restoring impacted areas. 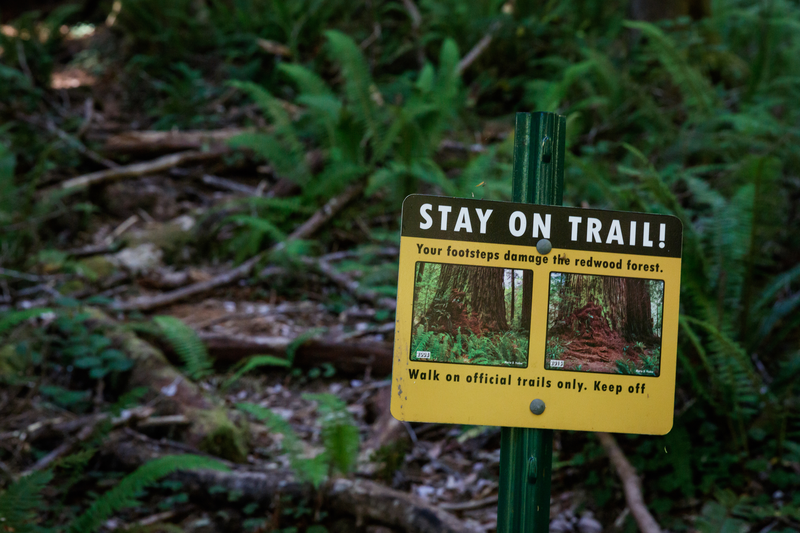 Developing interpretive programming and materials that provide information about the grove’s history and redwood ecosystem while encouraging visitors to stay on designated trails. Enhancing the visitor experience through a visitor usage study. Installing visitor services and amenities at trailheads along the Howland Hill corridor. This plan was developed by a collection of park managers, conservationists, and researchers, all concerned about the risks of significant damage to this natural treasure and disturbances to wildlife and ecosystems. A social trail weaves through the Grove of Titans. Social trails are so heavily used, they are difficult to distinguish from official park trails. Photo courtesy of Max Forster. Signs along the nearby Mill Creek trail direct visitors to stay on trail. “Your footsteps damage the redwood forest”, the sign reads.